In 2017, the Group continued to release string and country songs for top-rated artists covering every consumer target groups, namely pop, rock, alternative, country (songs for life), R&B, soul, and compilation of top hits during the year. The Company plans to produce more universal songs to expand new audience base, for instance Thai country music has been developed to gain wider popularity as Pop music. Sales and distribution is carried out through modern trade channels (superstores and discount stores), traditional trade channels (wholesalers and retailers) throughout the country, and also opened booths at trade shows and shopping malls along with e-commerce and call center. Fast developing technology together with the changing of consumer’s behavior caused the music business to develop new channels of distributing the product to respond to consumer’s behavior and generate more revenue to the Group. Digital content business is to convert music content into a digital form for distributi on to mobile telephone networks, the internet and entrepreneurs, with categories of download services, such as ringtone, ring-back tone, full song and full MV, in both a la carte and subscription services through channel application 123GMM on both iOS and Android, website www.gmember.com and iTunes Store. Also included are the services for listening music on the internet without the needs to download “Music Streaming” through an application on computers and mobile phones which enable customers to enjoy the hot music tracks worldwide. Consumers can listen to play on demand tracks online, listen from playlists or download and save for listening offline. In addition, the Group content exposure has been expanded via GMM Grammy Official Acco unt on YouTube with rapidly growing numbers of channels, subscribers and revenue sharing. For 2017 GMM Grammy Official on YouTube celebrated the success in diamond button award with more than 10 million followers. The Company has broadened its contents into digital platform through collaboration with Spotify, LINE, JOOX, OMU to strengthen music streaming service. At present, the revenue from digital music grew constantly and would contribute a significant source of revenue stream in tandem with world music industry trend. The Company manages and collects copyrights fees from food operators, restaurants, radio operators, karaoke outlets, and karaoke booths and other operators who use the Company’s music for commercial purposes. In 2017, the Group organized 20 large-scale concerts, including Labanoon Concert, Stage Fighter Round 2, 25 Year Poompuang Duangchan, Klear Concert: The First Space, J-DNA, NJ’s Story Concert: The Original, Lomosonic Anti-gravity Concert, WhiteHaus 2-4 Chairs, 50 Year Pre-Retired Pang-Nakarin, as well as grand music festivals including Nung Lenn Festival 2, Urban Music Fest Live in Siam which featured the country’s top rated artists from all music genres and record labels joining force in live performance on Siam Square Stage to please music lover communities, and celebrated the end of year with BMMF 2017 back to Khao Yai venue with highest number of ticket sold. Besides generating revenues from the sale of tickets and sponsorship, this business also generates additional revenues from the sale of media recordings of concert as well. The Company has a policy to train and develop both Music and Non-music artists to enhance their capabilities in singing, acting, staging and dancing with an emphasis on artist development for genuine professionalism to reinforce performance results. In addition, it also tries to expand revenue channels for those artists in the forms of live performance in pubs and bars, as well as employment opportunities as product presenters under the Idol Business Model in order to extend the revenue stream. The Company has given priority to managing unique and talented artists leading to growing popularity through times, and bringing about sustainable revenue based on support and engagement of fan club as key success factor to maintain artist’s popularity. As the leader of musical business, GMM Grammy is determined to move forward the industry during the transition period to the new era with influences of digital media widening opportunities for artist exposure to worldwide audiences and proven success records. In the past year, the Company executed business model to keep up with competition in the digital world to generate sustainable revenue in the future. The growing trend of musical streaming system or listening music on mobile application or computer providing convenient options for listeners to choose music or set the playlists from the various channel. This exhibited overall business landscape changing from B2C to B2B via the cooperation with platform service providers such as JOOX, Spotify, LINE, and YouTube. Therefore, GMM Grammy’s policy is to search for new channel, especially digital channel, to better approach and fulfill consumers in terms of music video or streaming. Currently, the primary base of VDO Content was YouTube whereas the base of audio is JOOX, and other partners. The mission of GMM Grammy from now is to develop powerful and quality content which is the core principle of content provider. In addition, the Company has an auditorium, Muang Thai GMM Live House, on the 8th floor, Central World to host shows, events and medium-sized concerts, which supports the Show Biz business and also brings in additional revenue for the music businesses. The overall advertising expenditure in all media decreased from 107,923 million baht in 2016 to 101,445 million baht in 2017, a decline by 6.0% Y-o-Y due to an economic recession and deteriorated consumer purchasing power especially in the rural area. The highest growth in media spending throughout this year belonged to In-Store media with a surge of 34.6 percent Y-o-Y, followed by Cinema Ads, Out of home media, Transit media, and Digital TV growth at 25.0% 12.8% 10.1% and 7.4% respectively. On the other hand, major advertising spending on Publishing, Newspaper, Satellite TV and Cable TV, Radio, Analog TV, and internet decreased by 33.6% 21.8% 15.6% 14.9% 13.1% and 12.6% respectively. Source: AGB Nielsen Media Research (Thailand) Ltd. In the past year, advertisement media industry decelerated constantly with the great change of media consuming behavior in the past two years caused by hugely increasing budget for online advertisement whereas the overall digital TV in the 4th year remained the same, and the budget was allocated to the high rating channels. However, in the end of 2017, the positive sign from the recovering economic situation of the country signaled together with the purchasing trend of consumers. Therefore, customers spent more money on advertisement media, particularly TV advertisement. The revenue of digital TV, although it decreased during the mourning period, was likely to recover because TV was the powerful media that approached all Thais and created brand perception very well. Furthermore, the contents of new digital TV channel among the leaders were interesting and attracted audiences so the advertisement revenue has grown continuously. It was expected that the total value of advertisement market would expand again in 2018 from the economic supportive factors such as the increasing value of stock exchange, the expanding export and tourism, and the stability of politic that would reassure the consumer confidence. Amongst the harsh competition of digital TV, each channel presented the smashing content to gain rating. All stations attracted audience with premium quality content that was unique and characterized to interest audience to watch live program rather than the online platform. This was the variable of creating rating for more advertisement revenue and creating brand recognition to audience. The overall transition progress towards digital TV has made a significant inroad this year, with growing Thai audiences reaching the digital TV as evident from higher viewership at 86.96% for digital terrestrial TV and 13.04% for cable & satellite TV by the end of 2017, up from 2016 with viewership at 84% for digital terrestrial TV and 16% for cable & satellite TV. (Source: NBTC). The NBTC has increased digital TV public relations to provide an understanding on digital TV antenna, signal tuning and installation. As of 2017, a total of 17.55 million subsidy coupons had been distributed, with 9.83 million coupons or 56% were redeemed. (Source: NBTC). In 2017, the NBTC made an announcement to extend the period of Set Top Box redemption from December 2017 to 31 March 2018 to encourage more people to exercise the coupons. In addition, more upsides to digital TV industry in 2018 are derived from the government aid measures to extending the period of license payment, supporting the expense of satellite signal for 3 years, and reducing license fee (sliding scale) as the new criteria would enhance the turnover of digital TV business further. Focus on content that is outstanding, interesting and has variety since viewers select program based on content. Interesting programming will create an impression on viewers and make them remember the channel. The Company will create and develop high quality content in the form of drama, news, variety and game shows that offers a new choice for the audience. Create wider audience awareness of digital TV under GMM 25 and One 31 Channel. The Company is planning promotion through a variety of channels such as large advertising boards, online media, printed media and promotional activities at various locations and competitions, as well as running a campaign and participating in cross-marketing activities with partners to expand digital TV audience base by engaging partnership clientele. The Company intends to establish both digital TV channels as leaders in Thai digital TV industry that is strong and has high quality. Production of contents or programs to be broadcasted through radio stations requires the frequencies that have to bid from various state enterprises. In 2017, the Company has 3 radio stations, each station has strong features and differentiated format to cover target customers. The radio stations in Thailand broadcast on the FM band and AM band. All radio frequencies are owned by state enterprises, and managed and arranged by the NBTC in order to create a level playing field and allow public sector to take part. Private radio station operators have to work with state enterprises who own the frequencies in the forms of concessions, joint production or time rent, etc, considering contributions to the frequency owner, format of programs, and financial status of the operators. In December 2016, NCPO exercised power under article 44 of the interim constitution grants authority to NBTC to revoke the licenses from state agency within 5 years instead of the old one which NBTC has to revoke the licenses in April 2017 in order to promote broadcasting and allow radio operators to have more time to prepare for this situation, in effect, radio station owners can continue to hold the licenses for the next 5 years, while NBTC is preparing for the master frequency plan according to the roadmap that would benefit to the entire industry and listeners. 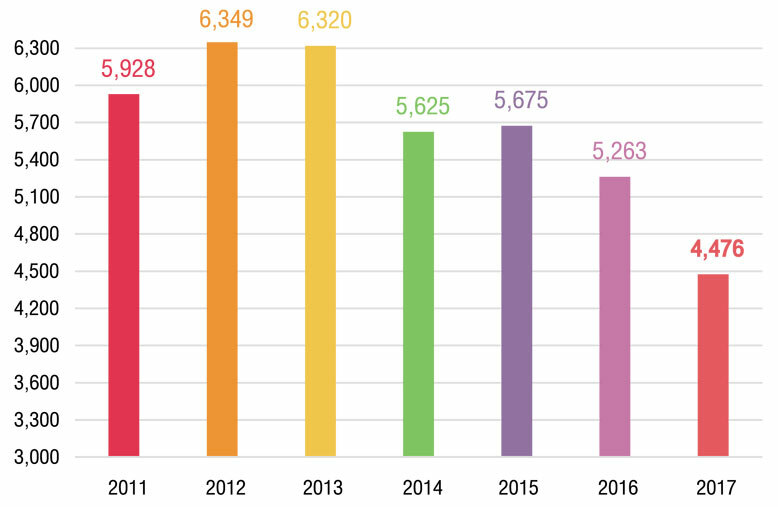 In 2017, advertising expenditure for radio was 4,476 million baht, decreasing by 787 million baht from last year, or approximately 14.9%, with a 4.41% market share of total advertising expenditure. At present, even though radio media has been affected by advertising downturn across all traditional media, radio is still considered one of the mainstream medias to reach a wide group of consumers at reasonable costs while efficiently interacting with listeners on a real-time basis. Currently, the competition of radio business was intense among the changing behavior of consumers. Therefore, the entrepreneur needs to adjust the strategies to enhance audience access and win station popularity by gaining more exposure through variety of platforms. The radio media would survive in parallel with online media, hence over the past year the Company has transformed radio business towards online platform coupled with on-air in order to access more audiences, leading to growing listeners across all platforms despite overall market downtrend. 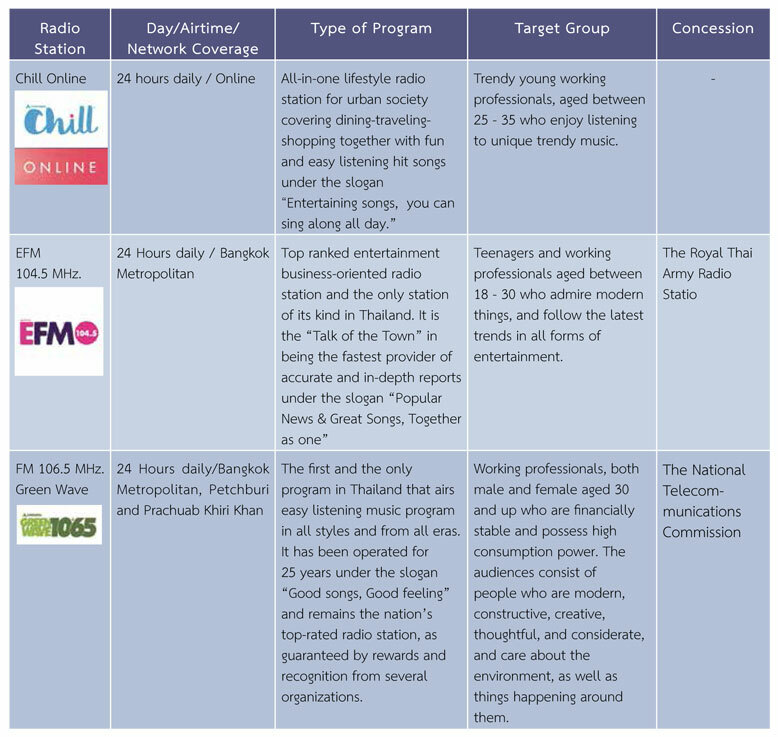 By providing service via Atime Online application to fit the lifestyle of new generation, three radio programs: Greenwave 106.5, EFM 104.5 and Chill Online, gained a total of 15 million ID audiences each month and the audience base expanded throughout Thailand and worldwide. The radio operators should continuously develop format and content to be up-to-date, innovative, and distinctive together with developing the marketing plan such as creating ongoing activities like artist meet-and-greets and mini concerts to build relationships with customers and listeners. Indeed, regular development of staffs and DJs to cope up with changes and adaptive to market situations are an important factor in maintaining long-term competitiveness. Movie Business of the Company operated under GDH 559 Co., Ltd., a subsidiary of the Company, with a total of two films released this year “Bad Genius” and “The Promise”. The company aims to continue releasing 3 - 4 high quality films a year. GDH intended to capitalize on its unique capability to produce variety of films and highest quality contents for the country. It is well-equipped in terms of production and personnel, comprising highly-skilled teams to create outstanding films that bring about differentiation and happiness for movie watchers. In 2017, industry earnings (box office only) were approximately 4,600 million Baht; of which foreign international movie took more than 90% of the share. The number of Thai movies also increased with 52 Thai movies were released; and independent producers and independent films becoming more active, while various alternatives of media and the situation of economic recovery leading to revenue underperformed with only few mainstream high-grossing films. However, this year witnessed Thai film strived to develop quality and the most successful film was “Bad Genius” from GDH with distinctive format and storyline presentation that upgraded Thai film standard, earning 112 million baht nationwide box office and was selected as the Opening film in The 16th New York Asian Film Festival-NYAFF in USA. Furthermore, it was the highest-grossing Thai film in oversea countries and awarded many international awards, especially Best Picture Award from the 16th NYAFF, the 27th Fukuoka International Film Festival, Fantastic Fest Austin 2017, Montreal International Film Festival 2017, and PIFFA Malaysia 2017, which was the pride of Thai film industry. Moreover, the new face “Aokbab- Chutimon Chuengcharoensukying” won the Best Actress Award from PIFFA Malaysia 2017 and Screen Rising Star Asia from the 16th NYAFF. In fact, the movie business is a high-risk business because of high investment required. One movie requires a combined investment for production and promotion of 50 -70 million baht. Production time is relatively long, taking approximately 8 – 18 months from script to release in theaters, while the degree of a film’s success depends on the popular trends with the audience, which cannot be predicted in advance. Moreover, international films receive more popularity than Thai films due mainly to a better screenplay and advanced technology of production. Stories and scripts must be fresh and remarkable. Thorough research is needed to produce each story. The screenwriter must use writing skills and possess knowledge of the movie language and conversational language in order that the message is clearly conveyed to the target audience. Branding: Film producers and studios must ensure moviegoers of their quality in any movies they produce, and that their movies always receive great receptions and are successful. Analyses are needed in order to truly understand target customers, determine the movie genre, and prepare proper scripts, actors and actresses, and the right public relations plans. These will help meeting demands of target customers. GDH 559 Co., Ltd. pledges to apply appropriate operating strategies so as to produce the works that will impress the audiences and gradually increase its popularity. Home shopping business is a business of 24-hour distribution of goods through program channel “O-Shopping”, where customers can choose products, even from their own residence. The business is managed by GMM CJ O Shopping Co., Ltd., a joint venture company of GMM Grammy Pcl and CJ O Shopping Co., Ltd., a leading home shopping operator in South Korea with international footprints in many countries including Thailand. With high market potential and business expertise of CJO shopping from South Korea, the Company aims to become the leader of Thailand’s home shopping business by creating a phenomenon of interactive home shopping programs that are superior, fresh, novel and unique, offering knowledge about products in a straight manner in all aspects, called Shopfortainment Channel (shopping, information, and entertainment), creating a family entertainment as well as a new alternative for shopping. The company focuses on variety of product selections with high quality standard, well-known and widely accepted by customers, as well as free-of-charge and fast delivery service all over the country. The company also provided multiple payment options as may be deemed appropriate by the customer, such as credit card or cash on delivery. Increasing variety of goods and emphasizing on trendy products such as fashion goods, lifestyle goods and E-commerce goods offered to meet demand from consumers of all groups. Developing online, internet sales channels and application on smart phone and social media. Tuning brand communication to create customers’ awareness that O shopping will be household assistant alike “A Trust Neighborhood” and building a relationship with Thai society via many public projects, for example, O Hug doing good deeds for the king, O Taekwondo, and Bike for Love, United Force for the Nation. Satellite TV business can be divided into 2 main components. "GMM Z" Satellite TV Platform" launched in March 2012 and is responsible for the sale of satellite TV set-top-box (STB) to consumers. GMM Z has a variety of products for the target audience of all levels. GMM Z HD Slim – the new model, enabling high definition transmission with Full HD 1080P, multiplicative function, high technology and smart remote control, well-organize groups of channels for ease of use. GMM Z HD Lite the model enabling high definition transmission with digital TV compatibility for customers who want to watch a high definition in an affordable price. GMM Z Smart for middle-level customer group, available for both C-Band and KU-Band satellite systems. GMM Z Mini for customers who have limited budgets but want to switch from antenna to satellite television. GMM Z Mini Gold is a new product with gold color façade and handy remote control. GMM Z ZEASON is the digital TV DVB-T2 set top box that enabling high definition Full HD, with a USB Port for watching movies and listening to music, embedded press buttons on cover, PVR system compatible, auto record your favorite contents, Biss Key, no more black screen problem, timeshift system enabling on-and-off broadcasting demand. GMM Z STREAM is the internet protocal TV box with Android 5.1 operating system providing Ultra HD 4K and support Air Mouse Remote. GMM Z HD WISE is the new model enabling high definition Full HD with PVR system, Time Shift system, and multiplicative media playing function. GMM Z Music Box is the new portable jukebox products, offering about 3,200 popular tracks from GMM Grammy artists, both country and folk songs with genuine copyrights all in one. GMM Z Mini Sky, the new look in white color with blue display screen, OTA system that adds channel automatically. Smart remote for simple use, LED screen has the new design of button for simple use. MP3 KARAOKE GMM Z STAR, free hit music from GMM GRAMMY copyright. Easy to connect with karaoke application. Applicable to Android and iOS phone with 2-way speaker power. Use as portable MP3 player. Satellite TV Media is the production of TV shows to be aired on satellite TV channels. Compared to the past, this business requires relatively low investments due to good domestic and international coverage of satellite signal, mitigating the need to install additional receiving towers. All it needs to operate this business are television channel licenses and good contents for broadcasting. * The channel is jointly-owned (50% each) with the Stock Exchange of Thailand, through the Group’s subsidiary, Family Know-How Co. Ltd. The satellite and cable TV business remains the television medium that has the greatest number of viewers in the country. Product owners and advertising agencies are therefore interested in the satellite and cable medium as an efficient method to reach their target groups. However, the satellite and cable TV platform has been severely affected from rising competition since the emergence of digital TV channels, coupled with NBTC regulated advertising airtime no longer than 6 minutes per hour, while this year the economic recession and advertising spending slow down persisted along with price discounts from small digital TV channel crossover to complete with home shopping; altogether leading to underperformance of satellite TV turnover. The entrepreneur has adapted and expanded to online channel as well as cooperating with strategic partners to sell contents to other platfom. The direction was likely to stable following consumers lifestyle and preference change from traditional media to digital and online media. For the Group, the satellite television business has an important role in supporting the public relations of the other businesses such as the music businesses, giving them greater exposure across the country.